Idea Mapping is a simple and profound tool that helps individuals improve productivity and use less brainpower while thinking, learning and creating. It gives people the ability to learn more and learn it faster than they ever have before. 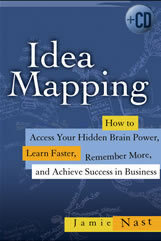 Idea Mapping teaches readers how to create and read Idea Maps, describes the three keys to learning Idea Mapping, helps readers avoid obstacles in learning this skill, and includes Idea Maps created by business people from around the world. This is the perfect guide for overwhelmed businesspeople, entrepreneurs, and other too-busy individuals who want to achieve more in business and life -- without putting even more pressure on an already overtaxed mind! Jamie brings her practical workshop right to the reader. Jamie Nast (Plymouth, MI) regularly operates workshops and has taught Idea Mapping to more than 20,000 people around the world. For bulk book orders call or email Jeff Gould from John Wiley & Sons at 201-748-6306. Project Management Professionals(PMPs) can earn 15 PDUs by attending the Idea Mapping Workshop and reporting PDUs under Category 4 - "Other Providers". Learn more about Jamie's upcoming 2-day public workshops. See both clips from Jamie's TV interviews where she creates several idea maps. Photos of Idea Mapping workshops and related items can be viewed here. You may see YOURSELF! !